A GRIP ON SPORTS • It’s another Thursday. And it’s another weekend of college basketball. How fast is this season flying by? We’re only three weeks or so away from conference tournaments. Read on. • The corner was turned long ago. The halfway point is a dot in the rearview mirror. It’s time to get everything locked in or to prepare for a long offseason. We’re that far along. No longer can teams be considered surprises. Disappointing teams, though, are all around us. But redemption can be had with a good stretch run. You want a microcosm of the season? Look no further than Cheney tonight. Eastern Washington, under first-year head coach Shantay Legans, hosts Montana, the undefeated Big Sky Conference leader. The Grizzlies are trying to do something not done in the conference since 2003: win every conference game. The last team to do that was Weber State. Since then, only Montana and Weber have been able to run through the regular season with just one loss. That’s something the Eagles would like to add to Montana’s record this season – and boost their postseason chances as well. Eastern is under .500 overall and that’s not getting it a berth in even one of the under-the-radar tournaments. But a strong finish, with a win against Montana included, could. • Idaho has the same goals, though the Vandals are starting at a bit better spot, as they are currently third in the conference standings. Montana looms at home Saturday, but that also means Montana State is in town tonight. Overlooking the Bobcats would be an understandable occurrence, but one UI can’t let happen. • Washington State is also seeking a bit of redemption, as the Cougars are mired in a six-game losing streak. They are also in the Pac-12’s cellar, with a 1-11 mark. The postseason isn’t a possibility unless there is some sort of miracle turnaround in Pullman. It would have to start tonight when Colorado comes to town. For Washington State to finish above .500, it would have to sweep its final six regular season games and then win at least two games in the Pac-12 tournament. Could it happen? We’ll let you be the judge of that. • Gonzaga already has found redemption, in the form of last Saturday’s dominating win at Saint Mary’s. Which just means the Zags can’t lose any of their final four regular season games if they want to have a shot at the WCC tournament’s top seed. It may be mid-February but in a sense, Gonzaga’s postseason has already begun. WSU: The Cougars have revamped their goals for the stretch run, as Theo Lawson’s story this morning explains. … There is more turnover in the football program, as strength and conditioning coach Jason Loscalzo has left for the NFL. Theo has more in this story. … Colorado expects WSU to fire away from beyond the arc tonight. … Elsewhere in the Pac-12, it may be a good time for the bottom part of the conference standings to rise up a bit. … Washington will honor Isaiah Thomas, who has been a role model for many kids on the West Side. … As Utah travels through the Evergreen State, the Utes hope their defense comes with them. … Oregon heads to Los Angeles knowing it has to win if it wants to make an NCAA case. … Oregon State wants to have fun. … USC’s hopes are slipping away in February again. … UCLA has been up and down. … The conference only two ranked teams, Arizona and Arizona State meet tonight in Tempe. They are similar in lots of ways. … There is some football news as well, with Colorado getting ready to start spring football. The same is true at Stanford, though the Cardinal may not have their quarterback. … Speaking of quarterbacks, the Pac-12 has had a few great ones. … Washington has recruited well. 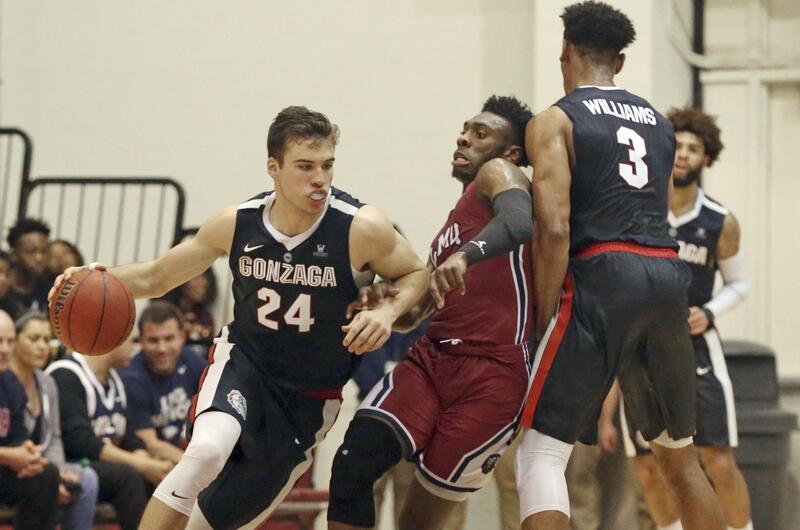 Gonzaga: The Bulldogs long walk back into first place culminated last Saturday in Moraga. Now they have to defend their spot. Jim Meehan has a preview of tonight’s home game with Loyola Marymount. … He also has a quick look at the Lions’ top inside threat. … The women are coming off their first conference loss. Now they have to travel to Los Angeles to face LMU. Jim Allen has a preview. … Around the WCC, San Diego would like to get back to the way it defended earlier this season. … BYU has been pleasantly surprised by a couple of players. … Portland knows where it stands. EWU: The Eagles’ matchup with conference-leading Montana is the subject of Jim Allen’s preview, though that’s not the only Eagle story Jim has today. He also has a feature on senior Sir Washington, who spent his first year in Cheney getting his grades to the point he was eligible to play. He will graduate this spring. … Elsewhere in the Big Sky, Portland State has been missing its best player recently. Deontae North has been suspended. … Southern Utah travels to North Dakota. … Idaho State is also on the road, but in a warmer spot. … It’s been a long time since Northern Arizona has won at Northern Colorado. Idaho: As we said, the Vandals host Montana State tonight. NIC: The Cardinal men had a chance to move into first place alone but couldn’t get past Big Bend. Chiefs: Spokane was in the Arena last night and picked up a 3-2 win over Kamloops thanks to the exploits of Kailer Yamamoto. Kevin Dudley has the story and Colin Mulvany the photo report. … Around the WHL, Vancouver upset host Portland, 4-2. Preps: As the basketball playoffs rolled on Wednesday night, and we have girls and boys roundups, Washington’s wrestlers were getting ready to travel to Tacoma for the Mat Classic. The state tournament begins Friday. Dave Nichols has a preview of what to expect. … Dave also previews the big school district title games at the Spokane Arena tonight and tomorrow night. State berths are on the line. … Pullman won the District 7 2A title at home last night with a win over West Valley and Theo Lawson was there. … Freeman took the District 7 1A title by defeating Lakeside at West Valley and Dave was there. … The Idaho girls state tournaments are this weekend. Dave has a preview. Seahawks: The Hawks have questions that need to be answered. … A couple of Jacksonville fans got an answer they probably didn’t like. Mariners: What would the beginning of an M’s season be without some news about an important offseason acquisition having health problems? Unusual, sure. But welcome. It’s not to be again this year. It seems first baseman Ryon Healy has a hand injury. Published: Feb. 15, 2018, 8:29 a.m.